In case you forgot after the clip was shown at the end of Daredevil's second season, Luke Cage REALLY is sick of buying new clothes. 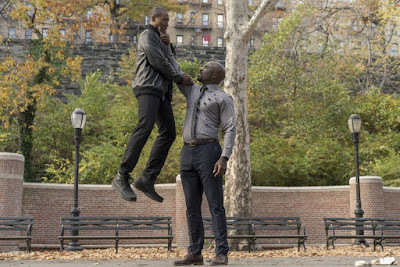 With only a month until we're all binging the Hell out of Luke Cage season one, Netflix has dropped the first clip as a reminder of the best way to piss the Harlem superhero off. The scene shows Cage (Mike Colter) taking on a handful of armed baddies in the local gym, easily dispatching them, of course. Then they bust out the gunfire and shred up his favorite gear, obviously not knowing that he's got unbreakable skin. Oops, guess his reputation hasn't spread as far as he hoped. Luke Cage debuts September 30th, and follows on the heels of Daredevil's two seasons and the first for Jessica Jones, which is where Cage debuted as the detective's on again/off again boyfriend.